When her stepfather dies, Miss Lois Cayley finds herself alone in the world with only twopence in her pocket. Undaunted, the intelligent, attractive, and infinitely resourceful young woman decides to set off in search of adventure. Her travels take her from London to Germany, Italy, Egypt, and India, as she faces various challenges and meets an assortment of eccentric characters. But when her true love, Harold Tillington, finds himself accused of forging a will and faces prison, Miss Cayley will need all her ingenuity to investigate the case, solve the mystery, and save Harold from the diabolical plot! 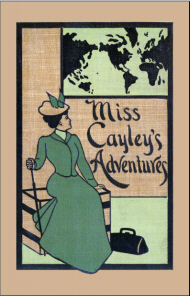 One of the first novels to feature a female detective, Grant Allen's Miss Cayley's Adventures (1899) remains as witty, enjoyable, and engaging today as when first published. This edition includes a new introduction by Elizabeth Foxwell.